[MULTI] Incident Response and Computer Forensics - Jiwang WareZ Scene | Free eBooks Download - EBOOKEE! Posted on 2011-10-30. By anonymous. Chris Prosise, Kevin Mandia, "Incident Response and Computer Forensics"
A strong system of defenses will save your systems from falling victim to published and otherwise uninventive attacks, but even the most heavily defended system can be cracked under the right conditions. Incident Response aims to teach you how to determine when an attack has occurred or is underway--theyre often hard to spot--and show you what to do about it. 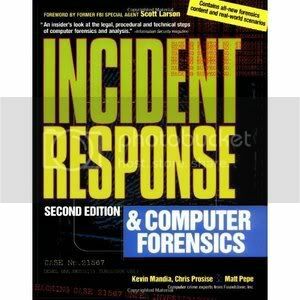 Authors Kevin Mandia and Chris Prosise favor a tools- and procedures-centric approach to the subject, thereby distinguishing this book from others that catalog particular attacks and methods for dealing with each one. The approach is more generic, and therefore better suited to dealing with newly emerging attack techniques. No comments for "[MULTI] Incident Response and Computer Forensics - Jiwang WareZ Scene".